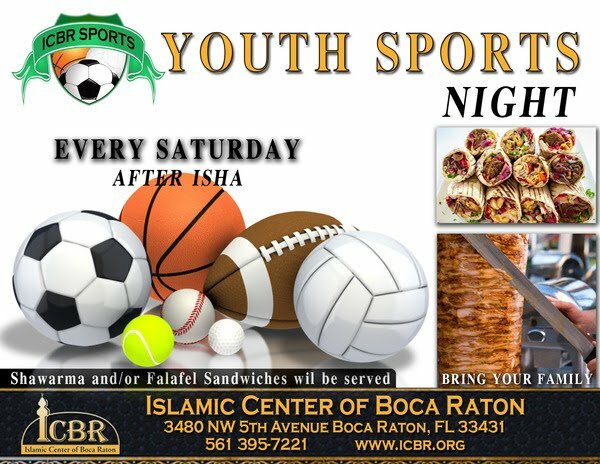 Dear brothers and sisters, the lslamic Center of Boca Raton(ICBR) and the Islamic Center of South Florida (ICOSF) will be coordinating together to make a successful COMBINED family night every weekend in EACH center. Starting from this weekend inshaAllah there will be a family night event on every Saturday right after Maghrib time at ICBR. Starting from this weekend inshaAllah there will be a family night event on every Friday right after Maghrib time at ICOSF. This is done in the spirit of keeping our communities working together collaboratively inshaAllah for the betterment of our bigger community and keeping our youth and families attached to our masjids and faith, while finding friendships and support in the Muslim community. The family nights are amazing events of halal foods, sports and activities, faith-based short lectures and wholesome family time with fellow Muslim families. Delicious food will be served at a nominal cost of $5 which is used solely to help support those activities. We urge every one to be a part of and support this effort for both masjids working together in these activities, please bring your families and enjoy the events under the blessing of Allah SWT.